MIS expands its library services to better suit the growing educational needs of all our students from Nursery to grade 12. 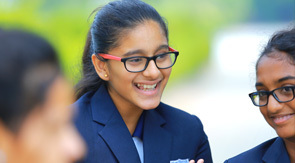 The campus has two student-centred libraries – Primary year and Middle year – which provide varied, appropriate and exciting resources to support and enhance learning and teaching. Our two libraries are active facilities where students are taught and practice research and other 21st century information skills that are necessary for lifelong learning. Our libraries house thousands of fiction and non-fiction books, various reference materials, a parenting collection, magazines like India today and economics times etc. The libraries facilitate collaboration between students, staff, parents and the wider school community through the provision of vibrant, flexible spaces, both physical and virtual. These rich learning environments cater for individual learning preferences and contribute to intellectual quality and academic excellence. Specialist library staff empowers students as learners. Support for inquiry learning is provided through a sequential development of skills which enable students to successfully engage in a digital information environment. MIS Libraries inspire a love of literature through a rich and diverse collection of print and electronic fiction. The purpose of the school library media center at Manchester International School is to support the school community and ensure that students and staff are becoming life-long users of information. The library is equipped with books, magazines and CDs covering a wide range of subjects across 20,000 book titles supports to the academics ( CBSE, IGCSE, AS & A Levels, IB PYP & DP ) and also non-academics. Become effective and ethical consumers of ideas and information.